Cloud security again dominates the cloud news cycle this week. We’ve reported in the past about government cloud adoption, but a new survey has some sobering numbers about those migrations. The survey found that only 20% of government IT executives are confident in their vendor’s security. But there is a bright spot—90% are taking steps to manage trust with their vendors. Given our survey results, other IT executives would do well to follow the government’s lead in this regard. A flash poll from InformationWeek found that 40% of readers are less confident in storing photos and data in any cloud service. Yet only 12% of respondents said that they changed their personal practices or recommended some security tightening at work. Finally, an insightful column on InfoWorld explores the hysteria surrounding the iCloud hack. Rather than blame “the cloud,” those worried about security should focus on their own and vendor’s practices. A study of M&A in the second quarter of 2014 found that cloud and smart mobility drove 42% of technology deals. Of the deals greater than $1 billion, fully three quarters targeted internet, cloud/SaaS companies, or Internet of Things firms. As we’ve seen from our study, security concerns are top of mind for firms migrating to the cloud. To that end, worldwide spending on information security will top $71 billion this year, with data loss prevention experiencing the fastest growth over 2013’s spending. Another recent study shows how cloud is set to transform small businesses. By 2020, the report says, 80% of small businesses in the US will have migrated to the cloud. That’s explosive growth—today, 37% of small businesses have migrated to the cloud. One of the key takeaways from our survey of 350 business and technology executives was that although businesses have a sophisticated understanding of the benefits of the cloud, plans for migration are in short supply. This dearth of strategy may have to do with how decisions about the cloud are made. As you can see in the chart above, C-level executives have very different opinions on how these decisions are made. 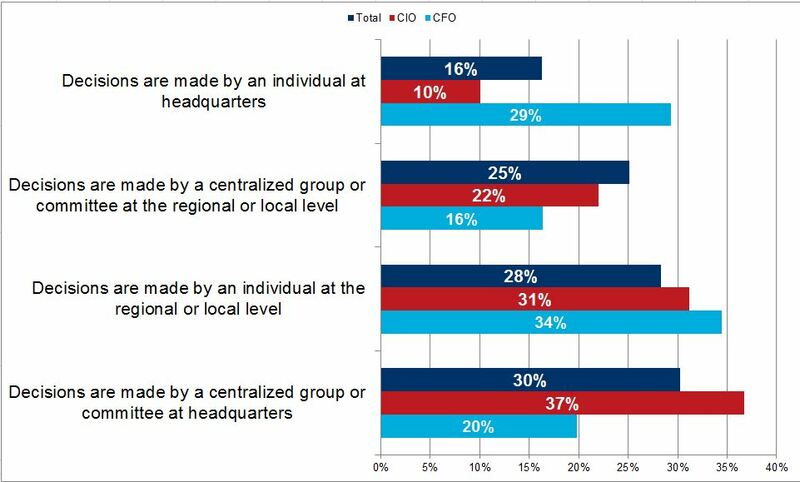 For instance, while 29% of CFOs say cloud decisions are made by an individual at headquarters, only 10% of CIOs say that. Furthermore, only 6% of the other C-level titles we surveyed agree with that statement. 30% of our total respondents said decisions are made by a centralized group or committee at headquarters. 40% of the other C-levels we surveyed agree, but only 20% of CFOs say that’s true. The differing responses to this question are troubling—in order to have a successful cloud migration, companies should agree upon and have a clear decision-making process when it comes to cloud and managed services. So far we’ve taken a look at the benefits that particular industry sectors are seeing from their cloud migrations, and what qualities they look for in a cloud services provider. Today we’ll focus on what executives are saying about the providers themselves. 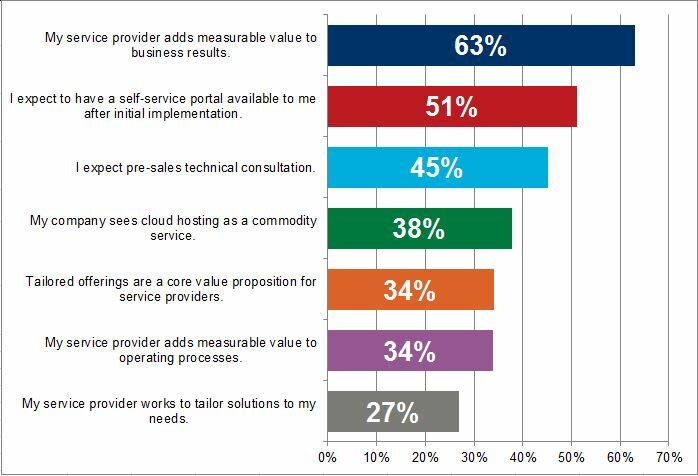 As you can see, a majority of respondents say cloud providers add measurable value to their business results. Among industries surveyed, financial services are seeing the most value—70% of respondents said their provider adds value—while only half of respondents from retail say that. Professional services firms are the most likely among our industry respondents to expect a pre-sales technical consultation (54%), while government/education companies are the least likely (37%). Meanwhile, healthcare companies are significantly less likely to see cloud hosting as a commodity service (28%), while government/education is the industry most likely to see cloud as a commodity (46%). Government/education organizations are also the least likely to say their provider adds measurable value to their operating processes, at 25%—but are the most likely to say their service provider works to tailor solutions to their needs, at 27%.